A new year, a new selection of books up for review. First up, regular guest Brent A. Harris reviews Elvira Wonders, by Sanna Hines, before I hop in with my latest round-up - including two Black Panther graphic novels as the countdown is on to the new Marvel movie. Elvira Wonders is, at times, an unfocused entangling of the lives of too many characters overstuffed into a disarray of storylines. It doesn’t know what story it wants to tell, so it instead tells all of them. I got the sense in reading this, that perhaps Hines had hoped to create a TV series out of the town of Elvira. If so, that makes sense. There’s a loose thread involving a murdered fairy that could connect the pilot to the end of the first season, with subsequent chapters/episodes producing their own mini-threads and soap-opera antics before stumbling back to the murder mystery bits. Now that it’s been quite a few years since True Blood has left the air, this book may quench the thirst of those looking for more Sookie Stackhouse. And make no mistake, Elvira Wonders takes its cue from the series: Fae, Werewolves, Vampires, Ghosts all exists as obstacles to each other on the streets and entangle in the sheets. Fans of the former who’ve run out of mystical material may wish to sink their teeth into Sanna’s story. 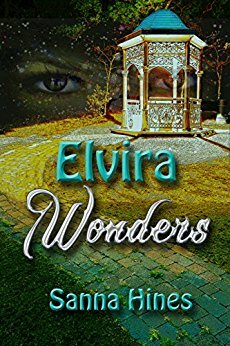 However, where True Blood takes its time developing the monsters, mayhem, and ahem – romantic encounters, Elvira Wonders takes everything at once and plunges it into the first book. Every fae and fable that exists in stories lives in the sleepy town of Elvira – whose residents decide to capitalise on the mythic creatures by opening sightseeing tours. However, not all of these creatures get along, and the tourism is threatened by infighting and murder. It’s therefore up to Josh, car mechanic, ghost hunter, and Fae investigator (nobody is just one thing in this town, it’s an odd mixture for sure) and full-time leer-er of Elviran women, to solve the murder of a Red Fairy. Why the police are unconcerned over the death is a bit odd, nor do the Fae themselves lend a hand. So, it’s not surprising Josh gets distracted by relationships, as do all the other denizens of the city, while the story dissolves into a dozen characters, toys around with different genres (romance, horror, family drama, etc) until Josh basically stumbles onto the murderer. At no times are the characters tasked with providing reasons or motivations behind any of their actions, nor is the reader asked to consider any deep themes or dwell on any subject matter. It’s Vampire Diaries for the page. Elvira Wonders isn’t a deep look into social strata, nor does it take time to flesh out any of its characters like the Stackhouse novels do. However, Elvira reads briskly, the characters function as quick go-to figures that are easily distinguishable from one another, and the world-building is fun and at times a good type of campy. It’s not a serious book – one of the most consistent storylines is the continued destruction of a Hummer and another features a writer who constantly complains about her critics. It’s a book that could be read through in one or two sittings. If you’re missing some Sookie, and you want something fast and light, I would check out the Wonders Elvira has to offer. 3.5 Stars, rounded to 4. Bonnie Milani is a smashing writer. If you haven't discovered her before, then really, you have a treat awaiting you. I still say the best place to start to discover the universe she has created is her novel Home World, but Monkey's Luck is a rollicking bit of action to jump into too. 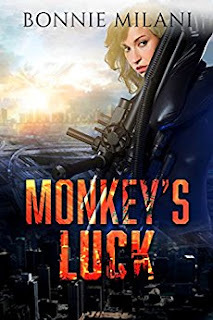 Kat is a wayward refugee, survivor of torture and space marine, caught up in a whole new world of hurt when the spaceship she's serving on gets blasted to hell and pitches her into an uneasy alliance with the ship's only other remaining crew member and a menacing Lupan named Romeo. Lupans recur regularly in Bonnie's tales - an offshoot of humanity with wolf DNA wrapped in the mix. Both Kat and the other crew member have their own altered DNA cocktails going on, each bringing with it certain behaviour patterns and strengths - or weaknesses. This is one of the nicest things about this tale - in that, despite rattling on at a fair old pace with explosions aplenty, there's a consideration at the heart of it of what makes us who we are, and what drives us to fight, or to love. There's romance, betrayal, drama and stakes that grow increasingly higher as the story goes on - all told, my only complaint is that I wish it was longer so we could spend more time with this intriguing trio. 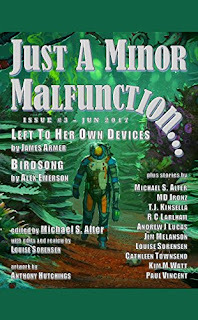 Twitter's a wonderful place for connecting with authors - and it was out in that digital playground that I discovered the Just A Minor Malfunction magazine. It's reached its third issue, and it's bristling with tales from contributors. Now, as devotees of short stories anthologies know - and goodness knows I'm one - some stories you'll love more than others, but there's a good mix in here. 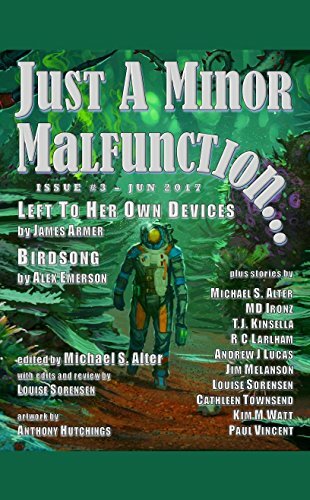 The opening tale is a cracker, Left To Her Own Devices, by James Armer, about an expedition to a planet where the ship's AI is perhaps more adventurous than the crew. I really liked this one, pulling together some neat character work in its short span and doing what good sci-fi should do, making you ponder wider horizons. Editor Michael S Alter has two tales of his own here - both good, but the pick of them is The Disappearing Cube, a story of a science experiment into folding space that has unexpected consequences for the scientists involved. If you're looking for light-hearted tales, then Kim M Watt's Anatidaephobia, which certainly fits the bill. A couple of the stories feel a little underdeveloped, but all told this is a nice addition to the magazine landscape. I'll certainly be looking to go back and check out issues one and two, so look for reviews of those in the future as I play catch-up. I feel it is a terrible sin of omission on my part that until now I have never read any works by Octavia Butler. I mean, sure, everyone has their gaps in their reading history, where there's an author here or there who you've always meant to get round to reading but just haven't. But Butler has been a glaring hole in my reading - until now. She freely admits in her introduction to this short story collection that novels are where her heart truly belongs, but this is a good way to delve into her writing, a gentle starter with the main course ready and waiting to follow, if you will. There are seven stories and two essays in this collection, kicking off with the award-winning title story. 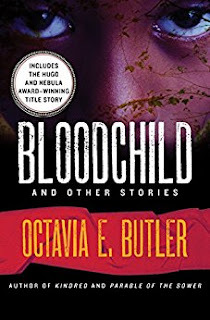 Bloodchild is a complex story of interdependent relationships, with humans being used as hosts to nurse the infants of an alien species, but at a cost. There are questions of what one is willing to exchange in order to survive, issues of abusive relationships and personal sacrifice, all heady topics swirling within the confines of a short story. Award-winner that it is, though, personally I prefer another story in the collection, The Evening and the Morning and the Night. It's a story of a society where a drug created to cure ailments such as cancer has after-effects, with the descendants of those who took the drug affected by a condition which can cause them to "drift", losing touch with the society around them and slipping into dangerous psychosis. Told from the perspective of the children affected by this disorder, as they face a future which seems inevitably to slip towards madness and death, it's a deeply poignant tale of how society deals with those it cannot cope with, and what happens to those individuals themselves - whether they can carve out their own future in a world that offers them none. These two stories stand out above the others, but there's still plenty of great reading to be had in the collection. There's no binding theme - though a recurring focus is on issues of biology and illness. One nice feature is that each story has notes after it with the author detailing her thoughts on the tale. For example, she addresses the fact that many think Bloodchild is about slavery - it isn't, though talk in the story of selling people hints that way. It's more complex than that, though, and very much worth discovering if, like me, you've been lagging behind on exploring Butler's work. With the new Black Panther movie looking astonishingly good from its trailers, a timely Amazon sale sent some of the recent comics starring the King of Wakanda tumbling my way. Well, I suppose from 2016, so not the most recent - but the run by Ta-Nehisi Coates has been raved about by fellow fans of T'Challa so it was about time I took a look. I've long been a fan of Black Panther - I tend to gravitate towards heroes who aren't mighty gods or universe-menacing Phoenixes - and so the combination of genius scientist and stealthy warrior has long appealed. I'll confess, though, that I'm awfully glad that I bought book two at the same time as book one. 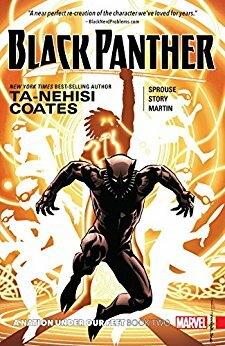 Coates takes his time to find his feet with his story - or rather, more to the point, he has a big story to tell but sometimes in volume one rushes through the actual telling, and you end up piecing a couple of the parts of the tale together in your head rather than reading it on the page. He's much more in his stride by the second volume, so if you find yourself put off a little by the opening collection, stick with it, it comes together much better as the issues go by. The story itself tackles the tale of Black Panther as king, fighting to hold together his kingdom from threats within and without. He isn't all-seeing or all-wise, rather he's a man underneath the legend, making political choices that might not always be for the best, but are mostly made with the best intentions. The tale tackles issues of nationalism, identity, monarchism and democracy - weighty matters that go beyond the usual supervillain hokum of many comics. Sometimes, that strays into territory of infodumping, but as I say, the method of telling the story keeps improving. 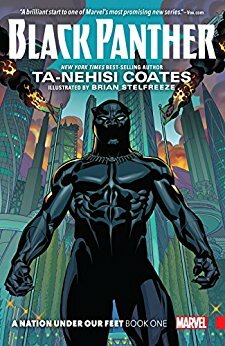 I'm not terribly sure it will serve as a great introduction to readers for the Black Panther movie - but it's a powerful look at the world the comics character inhabits - with a wider landscape than his stories are often afforded. Labels: Black Panther, Bonnie Milani, book review, books, Just A Minor Malfunction, Octavia Butler, review, Sanna Hines, Ta-Nehisi Coates.